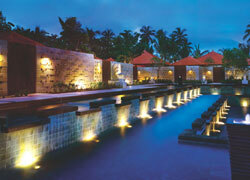 Bali In April 2007, Kriya Spa was opened in Grand Hyatt Bali. 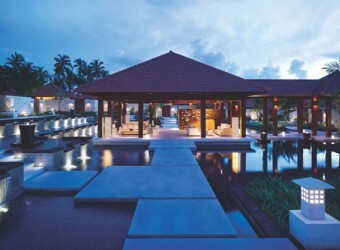 There are 24 villa building sites which are designed based on the ancient architecture of Water Palace of Bali. 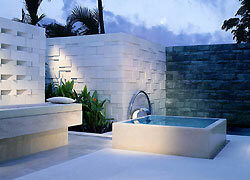 They offer treatments utilized the traditional Balinese healing philosophy; HARMONY, PURITY, ENERGY, and BLISS. 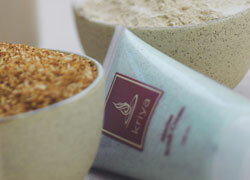 Please enjoy treatments based on Bali philosophy and natural products. Customised to meet your specific needs, our signature massage loosens tight muscles, relaxes the mind, and increases circulation of the blood. Your therapist works to help you achieve a harmony of your body, mind, and spirit. Rhythmic, vigorous strokes from your therapist’s elbows and forearms work to release tension and enhance flexibility. This is a traditional therapy that jumpstarts the metabolism. By incorporating the aromatic oils of cinnamon and Ylang-Ylang you’ll experience a surge in energy and benefit from the elimination of toxins that is a natural by-product of this therapy. This ancient practice utilizes the power of specially blended, pure essential oils to relax, detoxify, soothe, or stimulate. The massage technique combines acupressure point work with gentle lymphatic drainage strokes to improve mind body balance and provide ultimate relaxation. Utilising the traditional healing art of specialised massage techniques, your therapist concentrates on reflex areas in the feet that correspond to particular areas of the body, stimulating and improving your overall physical, mental, and emotional well-being. An intensive herb and oil based marma treatment, your therapist will focus on your scalp and spine. Working directly to calm the mind, this traditional technique also provides deep conditioning for the hair and scalp. Experience renewed energy and bring your body back in balance. This synchronized massage treatment is a combination of energy point stimulation and gentle friction strokes designed to stimulate the natural cleansing processes in the body. Smooth, heated volcanic stones are applied to the body in a pattern that restores and renews the muscles of the body and soothes the mind. The heat from the stones radiates deep into the body to restore much needed energy to tired, sore muscles. Famous as a traditional form of deep massage , this technique of manipulation uses the therapist’s palms and feet on energy lines and pressure points to unknot deep-seated muscle tension. Pressure point work aids in clearing blockages and enhancing body’s natural internal defenses whilst the traditional medicinal blend of cinnamon, clove, camphor, cajuput, generate heat and help to rebalance the muscle tone, improving flexibility. Your therapist will apply comfortable and appropriate pressure, using thumbs and palms, along the energy meridians to guide you and your body through this 5,000-year-old self healing ritual. Excellent for rebalancing energy flow and restoring the natural equilibrium of the mind and body, you will be wearing comfortable clothing as your therapist guides your body through a series of asanas. 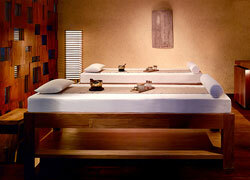 Abhyangam induces deep relaxation with the brisk invigorating strokes of this traditional massage. Shirodhara awakens the third eye as a controlled flow of warm oil or herbal water is gently poured over the forehead. Lulling the entire body into a state of calmness, this dosha-specific therapy and scalp massage revitalises the mind and body as your therapist works to heal your specific ailments. A traditional therapy, Shirodhara is a divine way to reduce stress, enhance both the physical and mental constitution, and promote longevity. Choornaswedam is a traditional Balinese therapy employing the application of warm herbal poultices in order to induce the body to exude profusely. Through the application of these healing bundles and complementary touch therapies, those suffering from arthritis, neurological disorders, aches, sprains and rheumatism should experience a welcome relief. This specialized treatment is ideal for lower back pain and stress caused by poor posture. Warm herbal oil is applied and then retained on the lower back by a traditional technique using black gram dough. 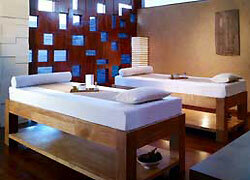 This is followed by a back massage that relaxes muscles, eases pain and strengthens the muscles. This is one of the most effective rejuvenation treatments and involves lukewarm herbal oils that are continuously applied all over the body by two therapists in a rhythmic manner. The massage is very slow and light, without exerting much pressure and helps stimulate rejuvenation of the body. The Papaya Body buff is an intense and indulgent treatment blending locally harvested papaya into a body polish that calms the skin, concentrates the mind, and rejuvenates the spirit. Great for the relief from rough skin and treatment of sun-damaged skin, this one hour retreat will restore your body, mind, and spirit to harmony. Our intense treatment for skin refinement with the goodness of Ocean Marine Minerals. This deep pore cleansing scrub refines the body by maximising the natural purifying properties of sea salt crystals and marine minerals. Excellent for dry mature skins. A blend of native vanilla pods along with crushed coffee beans is applied to the skin and, using specialised touch therapies, is gently massaged into your body to warm up the tissues, boost circulation of the blood, and increase metabolism leaving your skin smooth and emotions re-charged. Having originated as a royal treatment in the ancient kingdoms of central Java and based on the healing properties of Jamu, our Royal Java Lulur Ritual is literally steeped in the history of the region. This traditional pre-nuptial body scrub with cooling vetiver and beautifying turmeric harvested from the hills of Java will leave your skin glowing and spirits revived. ★Ideal for oily and problem skins! This traditional beauty ritual includes dry body brushing and application of a soothing body mask to refine and purify the skin. After the wrap, a gentle yogurt body splash restores the natural glow to give you beautiful healthy skin. The Balinese Boreh is a body wrap designed to ease most aches and pains. A blend of native clove, coconut, cinnamon, ginger root is gently massaged into your body so as to warm up the muscles, activate the mind, boost circulation of the blood, and increase metabolism. Calm and soothe your skin with a mask rich in cooling vitamins and Aloe Vera, nature’s most potent healing herb. Enriched with the calming qualities of cucumber and Aloe Vera, this wonderfully cooling body mask will leave your skin cool and mind calm. This envelopment is perfect for firming toning and contouring .Your therapist works to re-mineralize, stimulate lymphatic flow, and, ultimately to detoxify the entire body by application of this purifying spirulina mask. Delight your senses with our signature facial treatment, starting with a relaxing back massage and followed by a full facial treatment. The Royal Kriya facial involves an application of a luxurious mask of avocado and rose water from our Kriya Spa line of products and ends with a decadent foot massage. You’ll leave the Spa suite feeling pampered and adored, head-to-toe. Ingan Jyot, Sanskrit for ray of light and age, respectfully, is a facial designed specifically for injecting a new vitality into mature skin. This restorative treatment incorporates the technology of soft lasers to reduce the signs of pre-mature aging. By using the natural brilliance of light, your skin look and feel firmer, more youthful, and be energised with a new luminosity. Padmawati, the natural beauty and elegance of the lotus flower, is the purifying facial treatment to be customised to your specific needs. Your therapist will perform deep pore cleansing, exfoliation, and a gentle galvanic treatment, and then apply a serum massage and mask. Ending with the application of a protective face balm, skin will glow from the purification treatments and intensive hydrating properties of Lotus flower, known for its rejuvenating properties. ※ Those guest can not take this treatment due to using machine 1) Tooth under treatment or have filling. 2)The guest who have pace maker and have metal inside body. Madusuci, Sanskrit for natural, pure honey, is the most important ingredient in this therapy and a part of the tradition of beauty in Bali. Reduce stress and calm skin with this restorative head, neck, and face treatment. You’ll be treated to a traditional Balinese acupressure therapy for the face and the healing and harmonising properties of traditional Jamu herbs. Achieve harmony of the body, mind, and spirit with this series of treatments based on natural elements from the Island of the Gods. Experience true tranquillity with this series of rejuvenating rituals inspired by royal tradition of Java for health, beauty and radiance. Revitalise your inner strength by increasing vitality with this series of traditional Balinese energising treaments. Enhance your inner glow with a series of treatments designed to detoxify and restore the body, naturally. 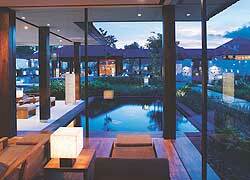 To make stronger relationship, taking the romantic treatment next to each other in Spa Villa. Including fresh fruit. As for Nusadua, Jimbaran, Tanjung Benoa Area, free pickup is possible from one person for a visitor of the use by menus more than US＄200. I had spa treatment using cream with fresh aroma. It was a detox treatment. After the treatment, I felt fresh.